Take part in an interactive journey through the realms of play and possibility. Visionary Virtuoso, David London, will guide guests through an exploration of magic, surrealism and creativity. 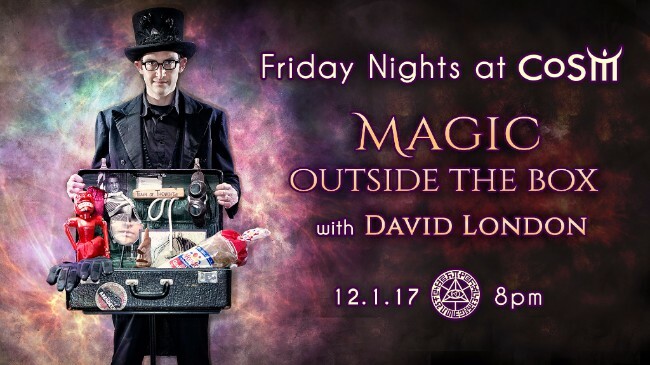 Magic Outside the Box combines magic with storytelling, comedy, and philosophy to create an original show parallel to none. 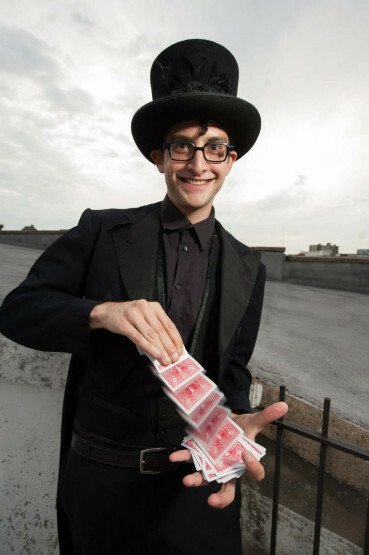 Peer into the mind of a magician and spark your creative spirit this Friday. Performance begins at 8:00 pm. David London is founder of the Circus of Wonders, creating unique entertainment and large-scale interactive experiences. He has authored 8 manuscripts on magic and illusion, including Daydreams, Borderland State and Imagining the Imagination, and regularly performs his unique style of magic at theaters, museums, galleries and festivals throughout the United States. Enjoy your Friday Night Dinner at CoSM: a delicious, healthy meal prepared by the house chef. Vegetarian options available. Dinner goes from 6:00 pm – 7:00 pm. Click here. Establishing your own core values helps harness your passions to their highest possibilities. Core values are the soul’s values, the rules by which our being expands, evolves or feels constricted. 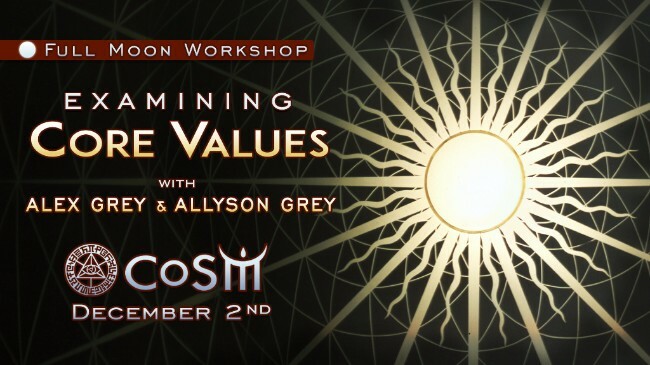 In this session, we will review the process by which CoSM arrived at our organization’s core values, and see how this system can be used to clarify an individual’s true heart. Perfect Compliments, painting by Allyson Grey. Each persons creative will is an operating system that can be continually upgraded by clarifying that one’s personal core values are empowering one’s highest visions for their lives as a service to the collective. Artists use allegory to point to virtues and higher aspirations as well as to warn the viewer of the characteristics of evil and vice. In this workshop, Alex and Allyson will examine the ideas of compassion, justice, liberty, truth, goodness and charity and call out the archetypal representations of these titanic forces portrayed by Visionary Artists for millennia. Bring a journal and writing materials for exercises that will examine our core values, creating a space of profound self-reflection. How can an individual make a real difference in the world? What are the deal breakers and clear possibilities in all the areas of your life? What can you be counted on? What commitments do you choose and what is expected by others? Join us to explore how re-framing our reality through creative expression and perception, through sacrament and prayer, can deliver us toward our moral center. 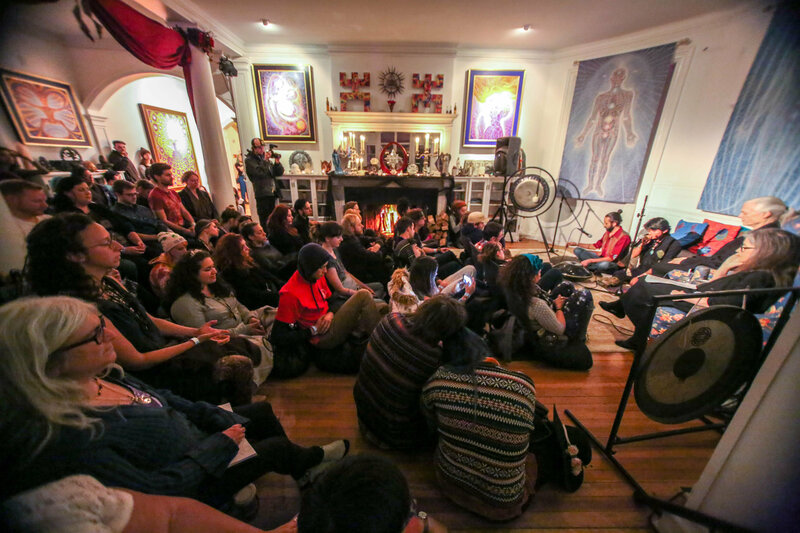 Share art and spirit with community and celebrate the return of the Full Moon. Full Moon gatherings occur monthly and each celebration is an unique and crystalline experience. 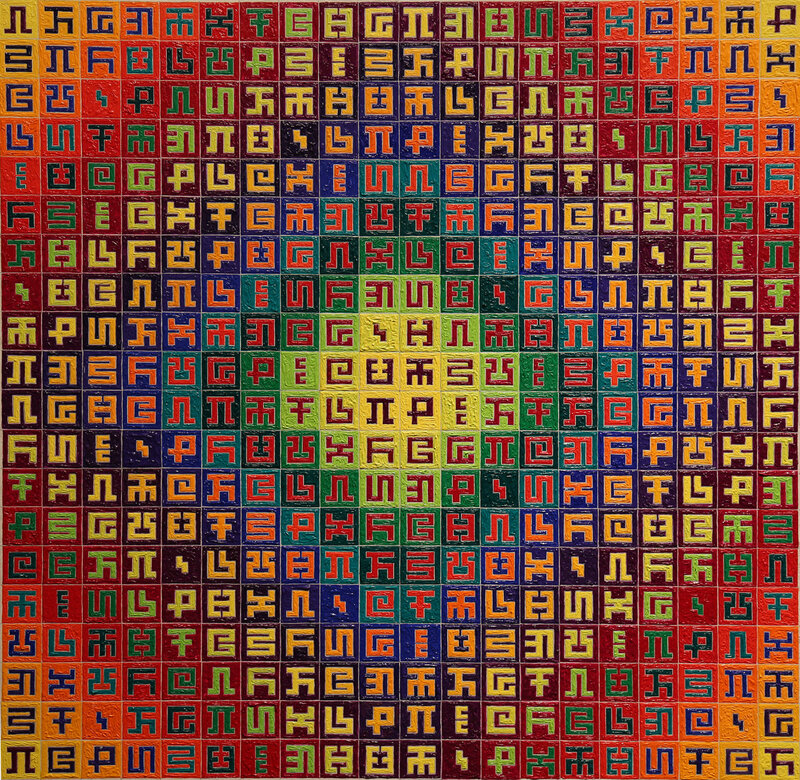 Join us for a performative evening of wisdom, poetry, music and art. Alex & Allyson lead the Opening Ceremony in the library from 7:30pm – 9:30pm. Seating begins at 7:00pm. Enjoy live music, interactive art making, and performance painting. 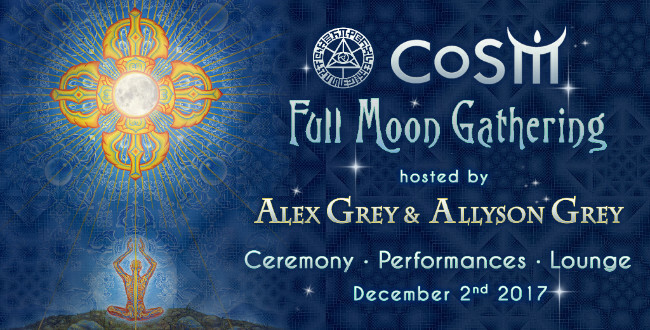 Alex Grey loves to create one “Supportrait,” a drawing of one guest or couple with proceeds supporting CoSM. Chat with Allyson about Art & Life during the After-Celebration. Check the progress of live painters Louie Izzo, Alexa Spaddy, Steve Shorts & Kaliptus. Have your body exquisitely painted by Caren Charles. 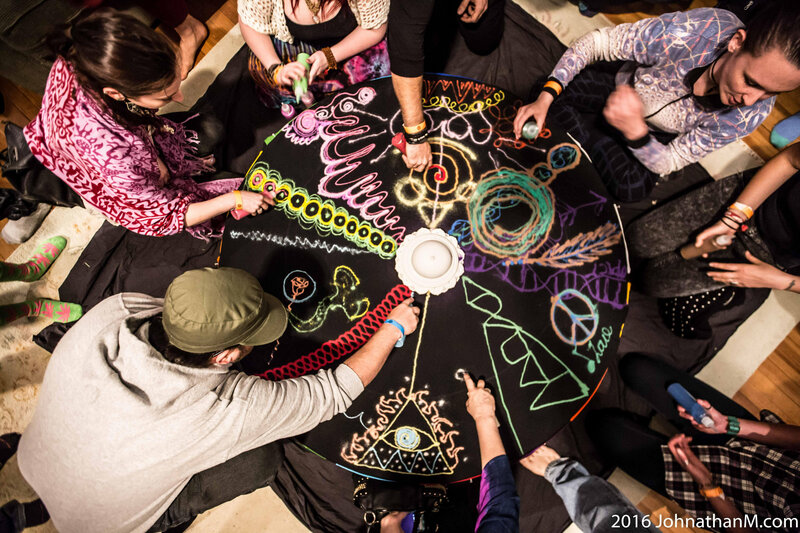 Set creative intentions in the community sand mandala, facilitated by Rosie & Dr. Mike. Be sure to get a tarot reading from the intuitive, Alexa Nicole. Celebrate the “Orb of Night” with visionary family and cosmic friends. Sunday, late-morning, come to CoSM for the ultimate out-of-body experience, Morning Yoga with Shipra. A CoSM favorite, Shipra gently guides yogis & yoginis toward their body’s own potential. Through illuminated guidance, Shipra leads participants toward rejuvenation on a safe journey to deepen any asana practice. All levels of experience will be comfortably nurtured and challenged in Shipra’s yoga class. Yoga begins at 10am, $10 donation requested. Mats available. Genuine creativity is not just a personal gift; it’s an evolving cosmic force that expands the identity of the individual beyond the bounds of body and ego toward a sense of oneness with a larger consciousness. Many great works, from megaliths to pyramids to cathedrals, were built by groups of creators aligning themselves with universal mind. 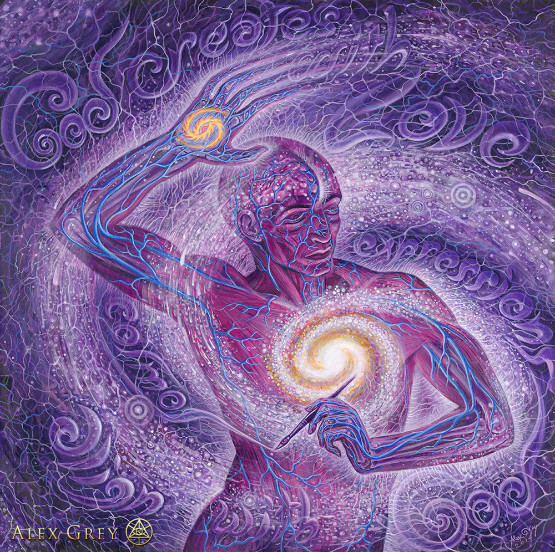 Cosmic Artist, painting by, Alex Grey. 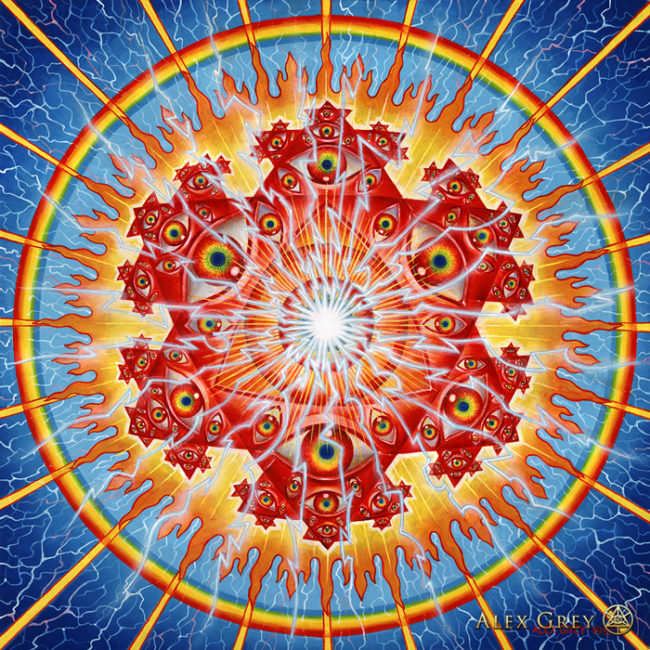 Join the renowned visionary artists Alex Grey and Allyson Grey as we explore how the aesthetic experience of art can lead us to unitive mystical experience and activate our inspired action in the world.